Thread: Has anyone ridden in a seat saver? As per topic, has anyone ridden in a seat saver? Either sheepskin or any other material? If so.. can you tell me if you felt like it made the seat or twist a little wider? Reason I ask is that I have an old Stubben saddle that I don't want to sell but I can't use. I love Stubben saddles, I love the concept, the spring tree, the close contact, the upswept panels, the small kneerolls.... but my seatbones are a little further apart than what suits that style tree. It feels like trying to ride on a fence post, the only way I can stay in it is by keeping weight on both of my feet. If I lose a stirrup I could fairly easily slip off sideways even at a walk. It's not just that saddle either, when I first started riding I felt the same about every saddle I rode in but back then almost every saddle was made that way. I thought that was normal and that everyone felt the same thing I was feeling, so it took me a long time to figure out. Anyway... I have this saddle sitting in a cupboard and if I can figure out a way to make the twist a smidge wider I could get some use out of it. I was thinking that a thick pile sheepskin seat saver might do the trick? Yikes, yeah that doesn't sound pleasant. I think I might have found something better, it's a gel seat saver and comes in a 10mm or 20m thick variety. The 20mm thick I'd think would fill out the twist a little bit? Has anyone ridden in one of these by chance?? Apparently it gives a bit of grip too. I finally rode (for the first time in ages) in the new swinging fender and learned a few things. 3) I can't trot in that saddle at all, I'm a bit of a hot mess. It'll make a great trail saddle though. 4) Rough-out leather is awesome!! 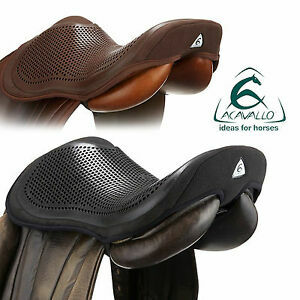 Truly... why don't more dressage saddles have rough-out leather?! The stuff is amazing. I used a gelpad one for many years til it sort of disintegrated.. comfy for me- looked a bit like the one you showed. Did you find that the twist of your saddle felt a little wider when you used either one, cyrus? There was no gravel rash at all! Maybe it's a jeans thing 'cause I was wearing joddies and had no trouble. Admittedly I didn't ride for long though so maybe that influences it. After a bit of a walk I was trying to get trot but instead got canter and after a few minutes of trying to get my seat together enough to stop, I figured we'd end it there and call it a day. I made my own from a close-clipped sheepskin many years ago, and sewed leather thonging ties on to attach to the D's at the cantle of my stock saddle, and two at the front where the breastplate D's are. Did a LOT of miles and it was so comfortable. Never had any issues with fibres at all, but being a close clipped one maybe solved the problem of creeping fibres; rough side was on the saddle and it sat there nicely without issue. I got asked to make them for others....but that was a no go, didn't have the time. Last edited by opensky; 17-01-19 at 09:37 PM. Without a horse you're half complete.